Pine solids showcase the natural strength and beauty of this bunk bed's wood construction. The simple style is a safe and versatile addition that any kid will love for his or her bedroom. The bunk bed also features an under bed storage drawer with casters to help keep organized. 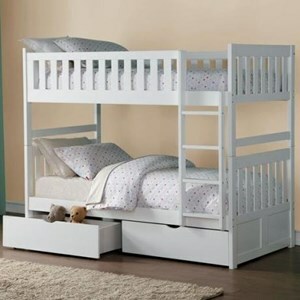 Perfect for siblings who share a bedroom or creating a bedroom that is sleepover-ready, kids and parents alike will find plenty to appreciate about this twin/twin bunk bed. 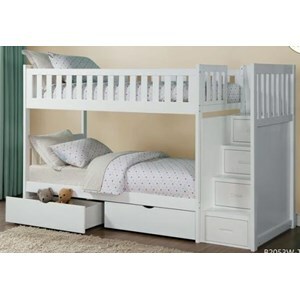 The Halanton Solid Pine Twin/Twin Bunk Bed w/ Under Bed Storage by Signature Design by Ashley at Beck's Furniture in the Sacramento, Rancho Cordova, Roseville, California area. Product availability may vary. Contact us for the most current availability on this product. 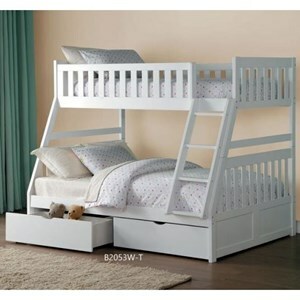 B328-59 Twin/Twin Bunk Bed 1 42.5" 80" 61.5"
B328-50 Under Bed Storage 1 75.25" 16.63" 12"
The Halanton collection is a great option if you are looking for Casual furniture in the Sacramento, Rancho Cordova, Roseville, California area. Browse other items in the Halanton collection from Beck's Furniture in the Sacramento, Rancho Cordova, Roseville, California area.